I’ve been thinking a lot about Bezalel lately. Bezalel was given knowledge and ability in workmanship. He could fashion objects in gold, silver and fit them with precious gems. He could prepare materials – timber into lumber, flax into yarn. And he could direct others. He was, to use a term from ancient Greek, an architekton. The architekton was knowledgeable in numerous crafts and techniques and could coordinate craftsmen in order to complete large-scale project. Often he is thought of as the first artist, but today we tend to think of an artist as someone with a certain vision, an ability to make something whose total is greater than the sum of its parts. These qualities were true of Bezalel. Yet, in some artistic quarters I’d imagine that Bezalel would be thought of as a technically excellent craftsman. This view might see him as an expert builder. People who are less interested in technical proficiencies and more interested in ideas often hope that art has a message; that art can persuade. In other company, artists might admire Bezalel’s workmanship, seeing that how well something is crafted is the dominant matter. Seeing a finely made vessel, piece of furniture, Judaica object, or technically perfect painting draws admiration. And of course there are some who try to bring process and product together in their own unique ways. The balance between the two is more of a dance, never quite the same in each artwork or artifact, but both sides are always present. 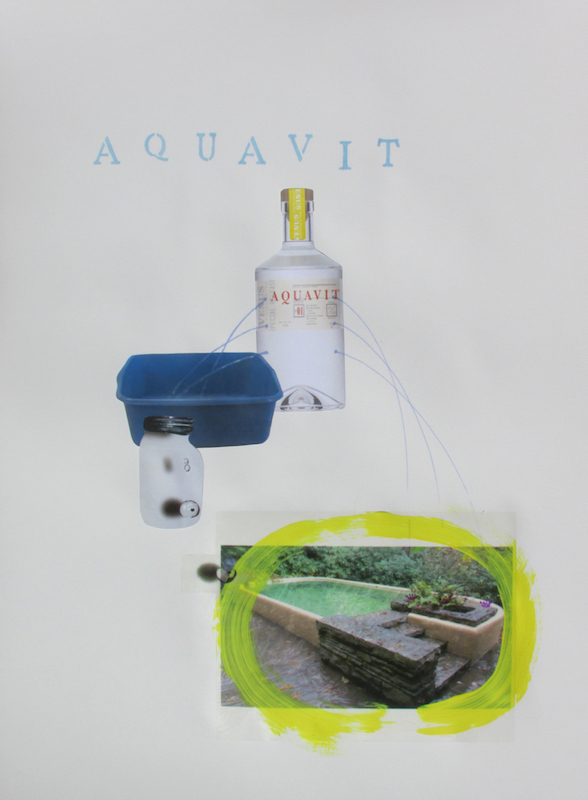 Ben Schachter, “Aquavit.”, a playful examination of the mikveh. The title is a play on words from Mayim Chayim to Aquavit, water of life. I’ve watched various people consider process and product in their own work. What is interesting is that artists go to different places to explore, share, and improve what they do. Lately, I’ve seen courageous artists post to Facebook seeking another set of eyes. They want criticism, advice, and encouragement all to better their work. These artists are asking for specific ways to improve their technique. It’s a joy to see these artists learn from, support, and admire each other. Other artists are more interested in ideas, emotions, and other qualities artworks inspire. Conversations about artistic ideas are harder to find online. I assume that they happen because I know of several artist-based beit midrashim throughout the United States. Those sessions I’ve attended focus less on technical advise and more on concepts, ideas, and the elements of art that in addition to technique (of course, I don’t mean to say that the painters seeking constructive criticism are not engaged in ideas, emotions and what their work inspires in the viewer, but simply that they generally ask technical questions online.) Perhaps these matters are more personal and less prone to receiving specific guidance from online “friends.” But it is also true that some artists prefer to hand over technical matters to others so that they can be fully engaged with an artwork’s meaning and mood. 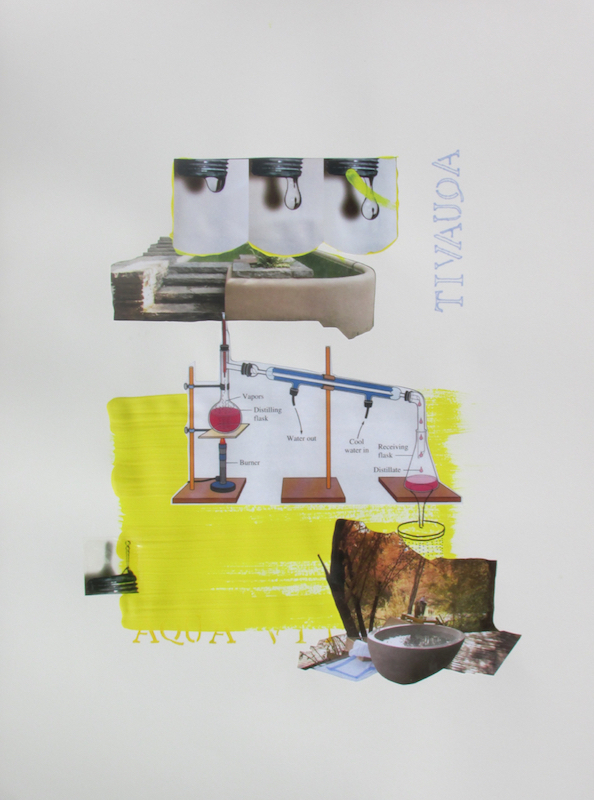 Ben Schachter, “Aquavit- Da Vinci”, a playful examination of the mikveh. The title is a play on words from Mayim Chayim to Aquavit, water of life. I find all of these decisions fascinating. I, for one, try to balance techniques and materials with the ideas I’m exploring. A successful artwork, in my studio, brings all three elements (technique, materials, ideas) together into a whole. How do these things balance in your studio? As the summer comes, I may write less frequently. Nevertheless, I, like so many, take the summer months to get work done. If you are such a person, I wish you a productive summer. If you have travel plans or are on vacation, bon voyage and enjoy. Ben Schachter is professor of Fine Arts at Saint Vincent College. He received both MFA and MS degrees from Pratt Institute. He is anELITalks speaker, and has addressed artist groups and attended conferences in the United States and Israel. His writing on art has appeared in several academic journals including Images: A Journal of Jewish Art and Visual Culture and, soon, in Ars Judaica. Other writing can be found in Contemporary Drawing in the 21st Century and It’s a in Line: Eruv from Talmudic to Modern Culture. His artwork has been exhibited at the Institute of Sacred Music at Yale University, Yeshiva University Museum, the Jewish Museum, the Mattress Factory and currently at the Derfner Judaica Museum in Riverdale, NY. He is the Jewish Art Salon’s first blogger. His first book, published by the Pennsylvania University State Press, entitled, Image, Action and Idea in Contemporary Jewish Art, will be available at the end of 2017. He lives in Pittsburgh with his wife and four children.